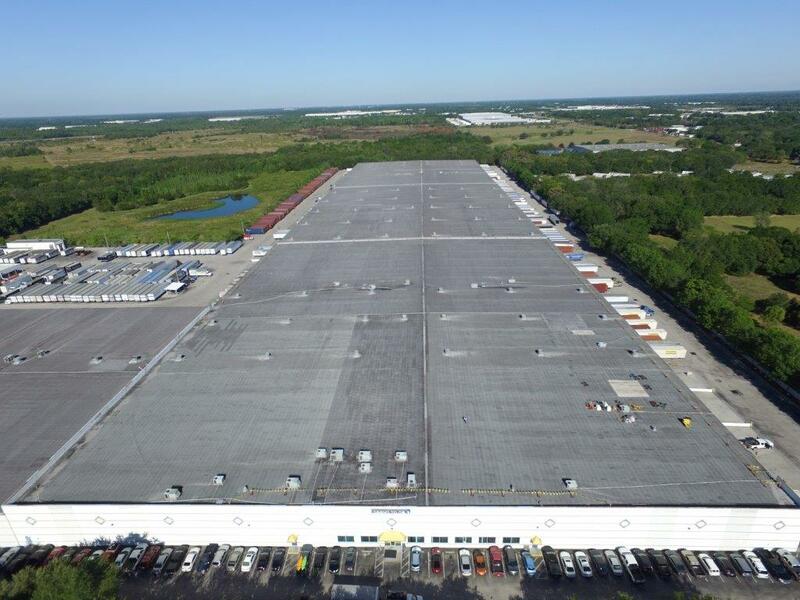 Project Size: 888,000 sq. 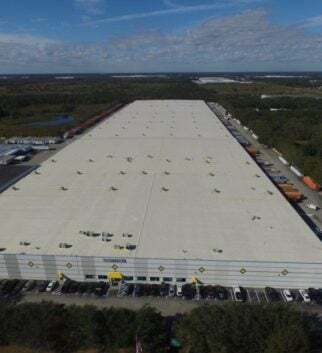 ft.
No downtime and no water intrusion during a massive Rooms To Go 888,000 sq. ft. roofing project. 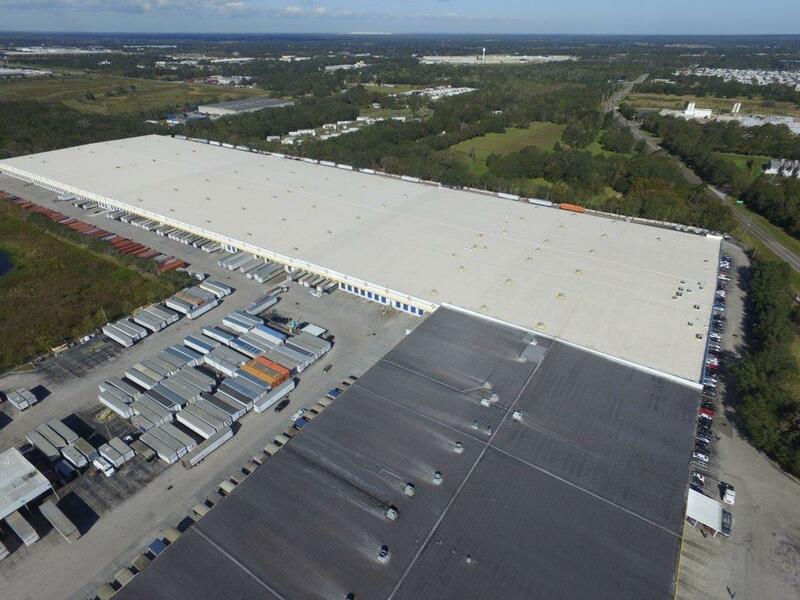 The Rooms To Go warehousing facility in Lakeland, FL is critical to its operations and when multiple leaks started to occur, they quickly called Springer-Peterson to the rescue. 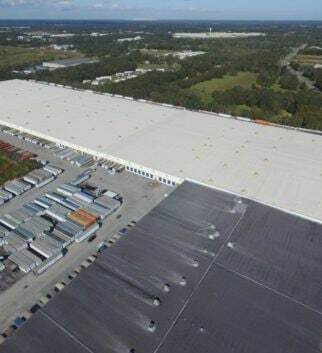 With our established relationship and successful track record of servicing Rooms To Go, we were thrilled to get started and solve their roofing issues. 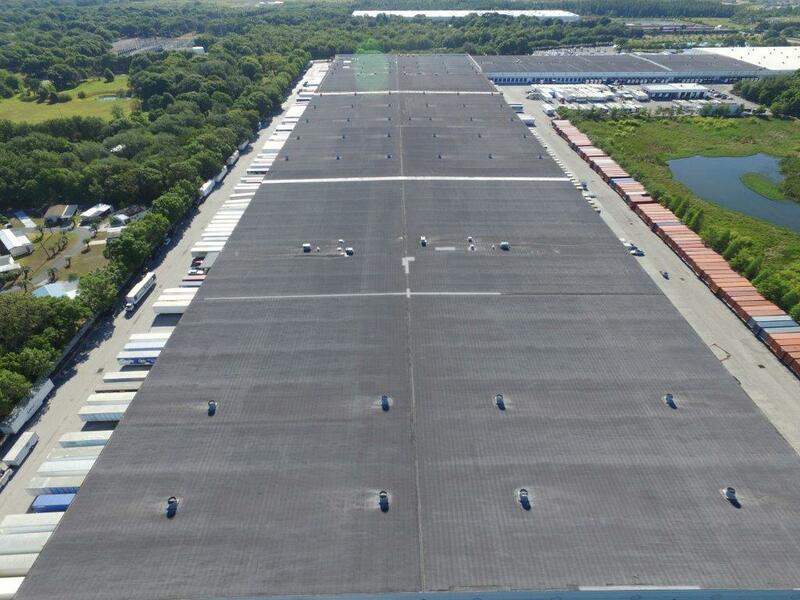 The Rooms To Go warehousing facility had a modified bitumen roof. 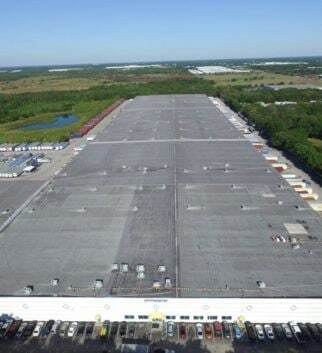 Its roof is mammoth in size at 888,000 sq. ft. Their issues didn’t stop with the multiple roof leaks but it was also about figuring out how to install gutters and downspouts given their active loading dock doors, swinging back and forth all day long. 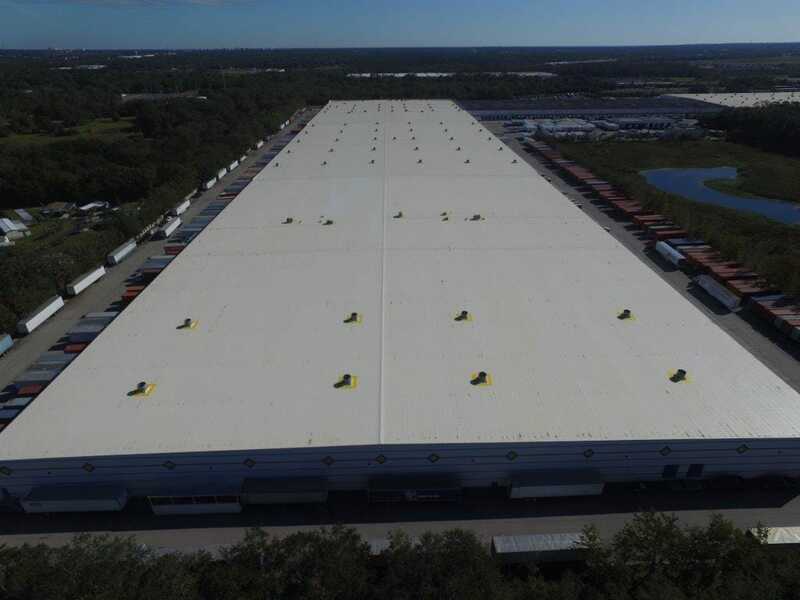 Their active loading dock doors were all around the facility and on both sides which presented a challenge to overcome during the roofing process. 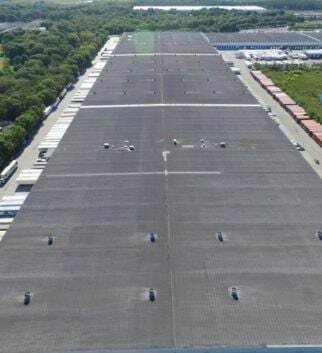 The solution we recommended to Rooms To Go was a Recover, also known as a layover roofing system. This is where the roof is re-covered over the existing roofing system. This solution is considerably less expensive than tearing down an old roof of this size and replacing it. As well, we could utilize their existing insulation and only needed to install a half inch of insulation between the old and new roofing systems, just to separate them. After thorough evaluation, we recommended a FiberTite single-ply roofing system. As a preferred partner of FiberTite, we were confident that this product would be the ideal fit for their needs. 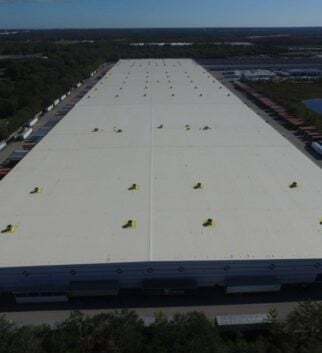 To defeat the active loading dock situation, we shut down sections of dock doors and worked on weekends to ensure we didn’t interfere with daily operations. We needed take these measures and use a manlift to effectively install the gutters and downspouts during the project. Some of the details of this project included installing one layer of half inch recovery board which was mechanically attached through the existing roof system into the metal deck. This installation was attached by RhinoBond plates and FiberTite fasteners. One ply of FiberTite 36 mil membrane was then installed using the RhinoBond induction welding system. All seams were heat welded. Brand new gutters, downspouts, and counter flashing were installed. In addition, a new drip edge was installed using FiberTite clad metal. Rooms To Go not only saved significant dollars with this project but the journey was seamless through creative solutions ensuring timely and effective completion. 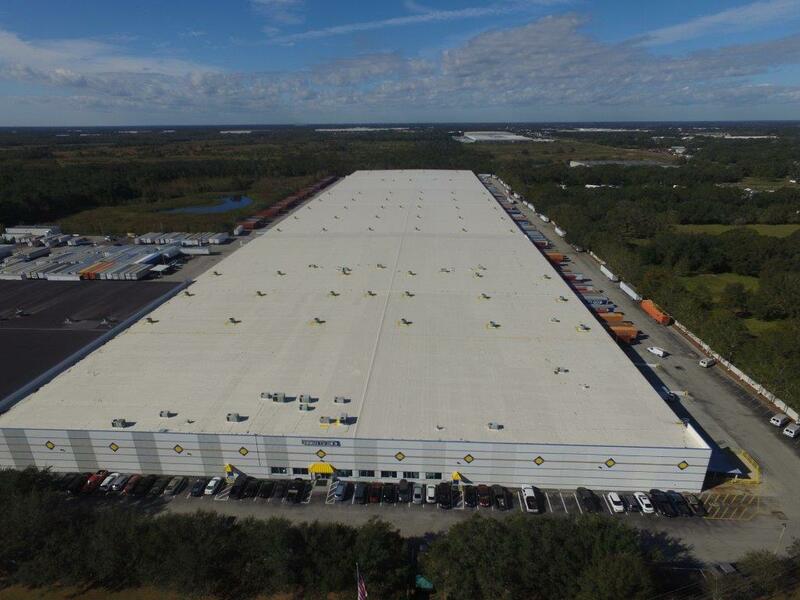 This project is one of many that demonstrates the wide capabilities that Springer-Peterson has when it comes to roofing.